Looks like you can finally have your tacos and wear them too, thanks to Taco Bell’s new collaboration with Forever 21. 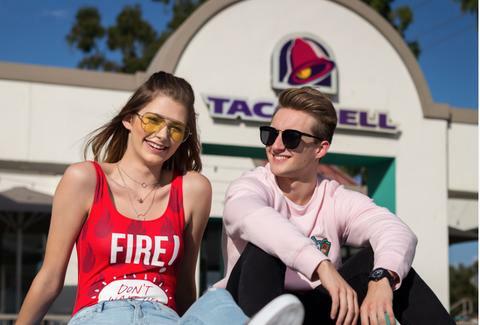 The exclusive clothing line, which arrives in Forever 21 stores around the world on October 11, is T-Bell’s first endeavor into the world of fashion, and the Doritos Locos purveyor promises to add a little sauce to your wardrobe. Literally. The collection will include everything from graphic T’s and anorak jackets to classic hoodies and, best of all, a red bodysuit emblazoned with the Fire Sauce logo. 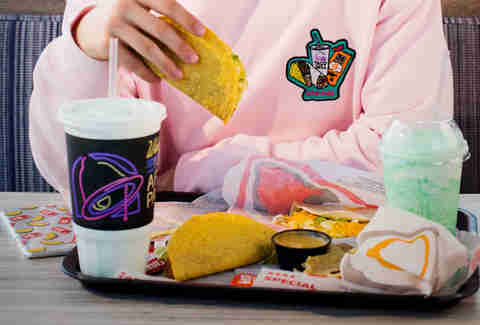 Beyond the full-body hot sauce garment, however, the whole line will feature some of the beloved fast food chain’s finest graphics -- think a hoodie in pale pink with the “live mas” logo stamped across the front. Now, rather than wearing your heart on your sleeve, you can wear a Crunchy Taco, instead. “We often think of taco bell as the ‘fast fashion of food,’” Taco Bell Chief Marketing Officer Marissa Thalberg said in a press release, “So when it came to our first-ever retail collaboration, we knew our partner had to be the leader in actual fast fashion.” To be clear, the company’s Las Vegas flagship store has been selling T-bell-branded items like bikinis, beach towels, and swim trunks for over a year now, but the new clothing line marks its first steps into the mainstream market. And for the most devoted fans out there,Taco Bell is even encouraging people to submit photos using the hashtag #F21xTacoBell that “personify their love of [the brands].” The taco-devotees who submit the best photos will get to see their imagery incorporated into the runway show on October 11 in Los Angeles. That is to say, you could end up being the glorious face of Taco Bell. Whether or not people will hand over cash for Fire Sauce-inspired apparel in place of actual fire sauce-drenched tacos remains to be seen, but nonetheless, the fashion world will never be the same. Eliza Dumais has spilled fire sauce on Forever 21 clothing, which is basically a collaboration.